By default, preorder titles are shown in Marketplace. 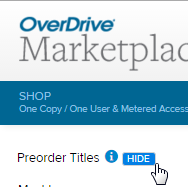 To hide (or show) preorder titles for your account, click your name in the upper-right corner of Marketplace, then click Show/Hide preorder titles. Select your preference in the pop-up window that opens. You can override your account-level preference during a Marketplace session using the SHOW or HIDE button in the left sidebar. 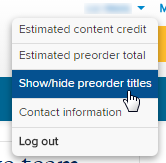 Clicking SHOW shows preorders, while HIDE hides them.